Extensive use of tobacco has become a public menace globally, as it is causing 5.4 million premature deaths each year and current trends predict that one billion people will die from tobacco use in the 21st century. In Pakistan, cigarette smoking and other forms of tobacco use have increased in recent years. According to Pakistan Health Education Survey (1999) tobacco kills almost 274 people per day and is causing at least 25% of deaths in the country. Tobacco use is largely concentrated among males in Pakistan; however the ratio between young urban male and female smokers is now 2:1 (Global Youth Tobacco Survey 2003). Smoking among youth has also become a serious concern lately as studies show that 1200 Pakistani children (ages 6 – 15) begin smoking every day. 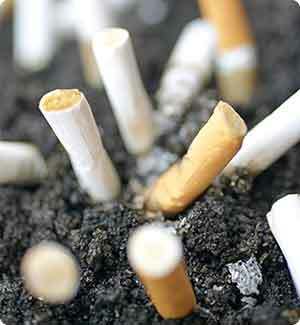 Although Pakistan government enacted the Prohibition of Smoking and Protection of Non-Smokers Health Ordinance in 2002, which includes limits on tobacco advertising, restrictions on smoking in public places, and adopted the Framework Convention on Tobacco Control (FCTC) in 2004, but the implementation has been slow as there continues to be a violation of the law in almost 36 major cities, noted Coalition for Tobacco Control – Pakistan (CTC-Pak) survey. “Had the Ordinance 2002 been implemented effectively, we would have been able to save our young generation from falling victims to the menace,” said Khurram Hashmi, national coordinator of CTC. Apart from the non-implementation of law, another major factor leading to greater use of tobacco is Pakistan’s moderately low tobacco product prices. A World Bank report (Feb. 2011) noted that the price (of the most sold and cheapest brand of cigarettes) per pack was US$2.83 in Sri Lanka, 1.65 in India, 0.84 in Nepal, 0.51 in Afghanistan while it costs US$ 0.23 in Pakistan – the lowest in the region. “Cigarettes have a record of seldom price increase in Pakistan. This has led to increased consumption of cigarettes from 292 cigarettes per capita in 1994 to 406 cigarettes per capita in 2007” informed Dr. Ehsan Latif, Director Tobacco Control of IUTLD. The question arises: what should be the right level of taxation? A WHO report (2008) ‘Cigarette Excise Taxes in Pakistan – A Way Forward’ after assessing Pakistan’s excises on cigarettes concluded that cigarette excise revenue has fallen from 0.5 percent of GDP in 1994 to 0.3 percent of GDP in 2007. The Federal Excise Act gives the Federal Board of Revenue adequate powers to assess and collect taxes; however political will to allow inspectors to access and/or find suspected sites of illicit manufacturing – appears to be lacking. Pakistan’s current three-tier regime for excising cigarettes is complex and pernicious as its annual adjustment to the rates and brackets increases the excise payable on the low-priced brands but reduces on mid-priced brands while leaving it altogether on high-priced brands unchanged, the report claimed. If Pakistan adopts the proposal it can lead to a 50 percent increase in the price of the most popular brands while consumption of cigarettes may decline by 18 percent, providing significant health benefits and the government’s revenue from cigarette excise tax may increase by 47 percent. WHO report (1999) “Curbing the Epidemic Governments and the Economics of Tobacco Control” claimed that by suggested a multi-pronged strategy to curb tobacco by rising taxes, disseminating research results on the health effects of tobacco, and access to cessation therapies.